A workshop for women who are either think they may be approaching, or are in, menopause. The sacred teaching of the autumn (menopause) quadrant of a woman’s life is sexuality….her sexuality starts to be linked with spirituality. It becomes a holy space. 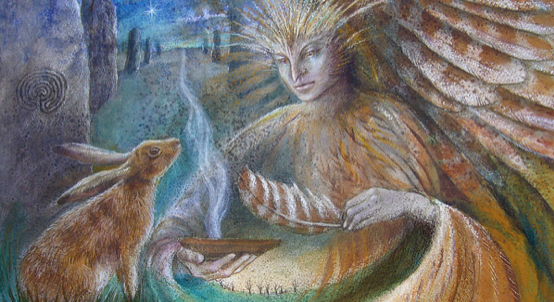 Claiming her place in this turning of the wheel, a woman journeys through an alchemical passage, taking time to look at what no longer serves her, and how the power in her now requires expression as she becomes an embodiment of the Autumn Queen. In honouring this passage she may find her sovereignty as woman in her full maturity and depth. A woman’s first rite of passage was at the time of her first menstruation, traditionally known as the menarche. In indigenous cultures this was marked with a ceremony as a way to initiate and guide her into her power as a woman. The ceremony marked the start of her spiritual life through her womb consciousness, the embarcation on a journey with her womb that will take her through many life experiences. The menopause is a radical awakening for woman. From a spiritual perspective it is a gateway into an even deeper alignment with the essence of a woman as the sacred embodiment of the feminine, and how to live that aspect in this world. It is arguably the most potent time for woman and the gifts it offers are deeply misunderstood and buried under the weight of the patriarchal system. It is a calling to her to discover her clarity that is unshakable in a world. To open to her bliss and power in a way that is in service both to her and to the world. Most women who are currently entering menopause were brought up in the paradigm that sees this time as the end of the road for her. Few women of this era ever went through a menarche ceremony or had any knowledge passed to them about the sacredness of the womb, of the power it holds or how to use these powers in service to ourselves and to life. Then the menopause comes and she is told by society that it’s all over for her. That she will be no longer needed for anything, nor wanted by men because she is not a maiden or a mother. The truth is that this is where it starts to get really interesting for women in a way that is not possible to comprehend until you are there. Modern Western culture has little clue about the power of a post-menopausal woman and there is a lot of cultural fear of her. This workshop is designed for women who are feeling the call of this change and wanting to work with it consciously. It serves as a container to prepare for or deepen this experience and really get inside what it is all about, so it can truly take you further into yourself as woman and you can really live the life you want to live, for YOU ! It will include a ceremony to mark this rite of passage and an opportunity to discover how this time of profound change can be a gift to you and take you into your power in a way that makes your life work for you. It puts you back at the centre of your life. You can feel something deep inside calling you, a whisper that won’t go away about changes you need to make in your life. You’ve an unexplainable sense of excitement that something amazing is being birthed in you; but you don’t know what. You’re hearing a big loud ‘NO!’ inside and you used to always be such a ‘yes’ person, so giving and helpful. You want to do something different with your life. A new understanding and ancient sacred teachings of what Menopause is about for you. A ceremony to prepare you for it or take you deeper into it. Share experiences and receive support with a circle of other menopausal women. Tools and tips to help you manage your wellbeing. AQ4 £380.00 incl. VAT Shared room in house 2-3 sharing fully catered.